The last film in the original series of Godzilla films. A direct sequel to the 20th anniversary film of the previous year with Ishiro Honda back in the director's chair and Akira Ifukube back doing the score. I love this movie BTW. One thing that makes Ishiro Honda a great director for these films is that he punctuates the epic goings on with acute moments of humanity. The scene of the woman evesdropping on Ichinose flirting with Katsura, Dr. Mafune's growing resentment of the aliens, Ichinose's general childish cluelessness despite the warnings of all around him. I love the line of dialog that kind of explains the aliens' transformation from Planet of the Apes apes to Beneath the Planet of the Apes mutants: something like "then we can build proper bodies again." Godzilla's entance in the movie (if you don't count the 4 minute recap of the previous film at the begining) is so awesome. We see his silhouette rising behind a building, Titanosaurus gets hit with the radioactive ray, flashes behind Godzilla further highlight the silhouette, and then the lighting changes (perhaps meant to signify our eyes becoming accustomed to the darkness) and Godzilla becomes clearly seen. It's also great to see Mechagodzilla indulging in some old fashioned city destorying. He really didn't do much of that in the last movie, and what was done was while the robot was desguised as Godzilla. I really liked this movie a lot more growing up, though it was second to the last I saw as a kid (raced home on my bike after school to see it on a "Godzilla Week" on Channel 4, the NBC affiliate). nowadays I can see the flaw in the film- no Godzilla for an HOUR. these were kids movies by 1975, and without our hero showing up, it's too much exposition. I still like the movie, but it's too slow moving for the time period. it's still above Gigan, and a few others, but not by much. Another of my favorites. This one matches (or perhaps even surpasses) the previous one in quality, in my opinion, even though it has a rather different vibe to it, which is due in no small part to the returns of Honda and Ifukube. My biggest qualm with the movie is Akihiko Hirata's performance as Dr. Mafune. He's a wonderful actor, but this is not his finest hour, as he pretty much plays a generic, over-the-top mad scientist. That said, he does have his moments, and I very much appreciate the problem that he begins to recognize as the story unfolds--his reaction when the aliens tell him that they'll build him a new home out of the ashes of Tokyo is quite touching. As lhb412 said, Honda's approach to the characters is quite striking. The crisis Katsura faces is very well-developed and dramatically effective, in addition to the other things already mentioned. The whole film has a sort of bleak, dreary feel without being depressing. It's an interesting atmosphere, especially coming off the more wild, carefree feeling you get from the previous film (not that I have a problem with the other movie, but it's a nice departure nonetheless). Ifukube's return is equally triumphant. Despite the repetition, which can admittedly be a little grating, the music works wonderfully with the movie. The fact that he uses the same theme for Katsura and Titanosaurus helps to tie together their common dilemma of being peaceful, gentle beings who have become pawns in a horrible plot of destruction. Katsura's variation of the theme gives strong reinforcement to the drama it accompanies and especially heightens the drama at the film's climax. Also worthy of note are the scenes of destruction, which are undoubtedly the best out of the '70s films. The shots of Mechagodzilla wreaking all that havoc, especially the missiles exploding underground, are among my favorite moments of action in the series. In addition, the monsters all come across quite well. Yes, this is certainly a favorite of mine, and it pairs well with "Godzilla vs. Mechagodzilla." I'm able to enjoy all of the '70s films to different extents, but these two are the best, hands-down. This was never one of my favorite films. However, as I grew up it went up in terms of appreciation. Titanosaurus and the whole Ichinose/Katsura story. It's extremely enjoyable, and while I do love the prequel better, it's a Showa film and therefore awesome. I think the most interesting aspect of the movie was Godzilla going against two monsters without partnering with another one. It was his alliance with humans that gave the movie an edge in much the same way as in another fave of mine Godzilla vs. The Smog Monster. The death knell of the mighty Showa era, and rightly so. The epitome of the mindfunking-over-the-topness trend that Tomoyuki Tanaka cited as irreversibly tarnishing the franchise forever. That said, Titanosaurus had a neat roar. This might be one of the more depressing films in the entire series. I mean, a character actually commits suicide! jellydonut25 wrote: I mean, a character actually commits suicide! This actually happened a few other times. Dr. Serizawa, Katagiri, and the Dr. Pepper drinking guy from Godzilla 1985 (happens offscreen). Katagiri, and the Dr. Pepper drinking guy from Godzilla 1985 (happens offscreen). Godzilla was not going to win. He pulled off Mechagodzilla's head and then was assaulted by a barrage of lasers. Katsura probably saved the day. This was one of the last movies I saw of the Showa series... and since I loved Mechagodzilla I could forgive a lot of the horrible editing in the American version of the film. As I grew older, it became nearly unwatchable, but then the CM DVD with the Japanese version came out and I fell in love with this movie all over again. While it's certainly not the best of the series, I like the character plots and it was a pretty good finale for the old films. No, she did it to destroy the Mechagodzilla/Titanosaurus control mechanism. I know ostensibly that's what's said on-screen, but I never really interpreted it that way. Seemed like she was actively CONTROLLING them, consciously and they wouldn't be able to operate without her WILLFULLY controlling them. So if she decided she didn't want to do it anymore, it wouldn't happen. (at least, that's the way it's portrayed in the movie up to that point) otherwise, what's the advantage of having the controller inside a human brain? Mac wrote: Godzilla was not going to win. He pulled off Mechagodzilla's head and then was assaulted by a barrage of lasers. Katsura probably saved the day. Yes, this is pretty much it. Mechagodzilla 2 is far more powerful than Godzilla alone. The fact that he had to fight Titanosaurus too means he was done for. Definitely one of my favorite Showa era movies and, possibly, my favorite out of the 70s lot. Godzilla's entrance is grand and probably the best out of the series. Him taking on two kaiju at the same time really goes to show how much of a badass Godzilla really is! I like Ifukube's score but it does get really repetitive when you actually listen to the score by itself. Some nice themes and marches, including a theme that's very reminiscent of Atragon's theme. A great entry and the ending to the film itself is the proper ending to the Showa franchise: Godzilla walking off into the sunset to take a nine year break before returning to Tokyo...this time to level it! I loved this movie more when I saw it uncut and in its original form. And actual ending before Godzilla sets off into the ocean in the sunlight was "poetic" if you want to call it that. Just wish the film was a bit longer. First Godzilla film I ever saw. My grandmother taped it for me back in '86 on a hunch that I'd like it. Yeah, I think she was right about that. It's not my all-time favorite Godzilla film, but it has huge sentimental value for me. I keep an original Japanese poster for the film above my computer (looking at it now) to honor it. 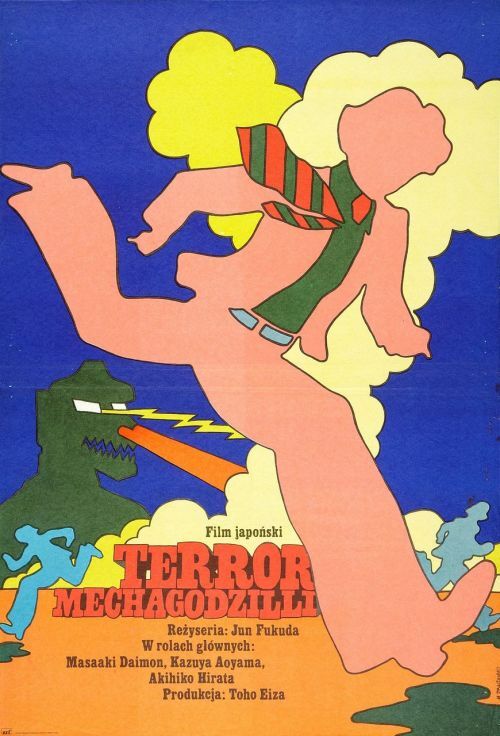 Terror of Mechagodzilla is one my personal favorites. I love the music and the overall dark mood in the movie. Of all the 70s Godzilla movies I like Terror of MechaGodzilla the most because it had Titanosarus in it which I thought looked really cool even more than Gigan imo! I also noticed that Dr. Mafune said that he found Titanosarus off the shore of the Bonin Islands 15 or 20 years ago. Well any kaiju fan knows that the Bonin Islands are a.k.a. Ogasawara Island a.k.a. Monster Island. This means that Titanosarus was the first kaiju lived on or near Monster Island. I also liked Katsura played by Tomoko Ai and she looked great! i really liked her when she wore that silver jumpsuit. I have seen both the english and Japanese version of this movie and i prfer the Japanese version alot more. Its a prtty good follow up movie to Godzilla vs. MechaGodzilla. I also liked the idea of having Godzilla battle 2 kaiju instead of just one. Terror of Mechagodzilla is utterly fantastic, and one of the few films of the Showa series that doesn't make me cringe all the way through. The Japanese version is remarkable, and the script is loaded with character depth unlike anything we saw in previous installments. Thank God they got rid of Sinichi Sekizawa with this film! It's a shame that the film bombed so badly, but it's leagues better than any Godzilla film since 1964, imo. Like someone else has pointed out though, Akihiko Hirata's acting is sub-standard, and it doesn't help that his motivation in the film made no sense. Godzilla and tons of other giant monsters had been ravaging Japan for decades, so why the hell would the institute mock Mafune when he claimed to have found a giant dinosaur? That makes absolutely no sense. I love film japonskis so much! That's an awesome Peter Max/Yellow Submarine-style poster! "The silencers on their guns did not look like ordinary ones...they also fired lasers, but I don't think that's too important."